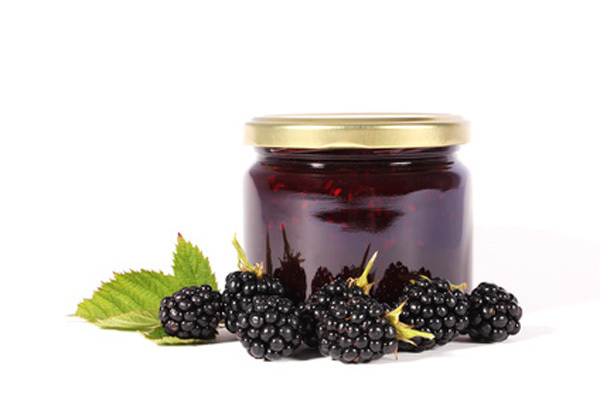 NOTE: Blackberries have a low amount of natural pectin, which is why lemon juice is added to ensure a good set. To clean the jars, preheat the oven to 140C/275F/Gas 1. Wash the jars well in warm soapy water then rinse thoroughly under running water. Leave the jars and lids to dry, upside down, in the oven. Place a few saucers in the freezer to chill. These will be used to test if the setting point has been reached. Wash the fruit in cold water and allow to drain well. Place the blackberries into a pan and cook until soft. Pass through a nylon sieve to extract the juice and remove pips. Measure the pulp and return to pan. To each 600ml/1pt of puree allow 450g/1lb sugar and 1 tablespoon of lemon juice. Add the sugar and lemon juice to the pan and cook over a very low heat, stirring every so often until all the sugar has completely dissolved. It's important to have the heat low so the sugar dissolves rather than melts and sticks to the pan. Bring the fruit mixture to a rapid, rolling boil (when the bubbles cannot be calmed down by stirring with a spoon). Cook for 3-8 minutes until the jam reaches setting point. As your jam approaches setting point, it will thicken and start to boil more slowly, with thicker, heavier bubbles. To test if the jam has reached setting point, first remove the pan from the heat while you test the jam – this is very important. Spoon a little of the jam onto a cold saucer, leave to cool for a few minutes, and then push your finger into the jam. If it wrinkles, it is ready. If not, return the pan to the heat and cook the jam for a minute or two more and test again. When the jam has reached setting point, carefully pour it into the sterilised jars (a sterilised jam funnel is very useful as the jam is very hot). Seal and cover whilst the jam is still hot. Recipe courtesy of Val Pardy. Val sells her jam to help dog rescues both in the UK and abroad. Her efforts are doing remarkably well and last year she raised £1000 for Garbo’s German Shepherd Rescue. So far this year she has raised another £900 for the Soi Dog Foundation helping neglected dog and cats in Thailand.